Please welcome back special guest poster Kathryn Goldman. 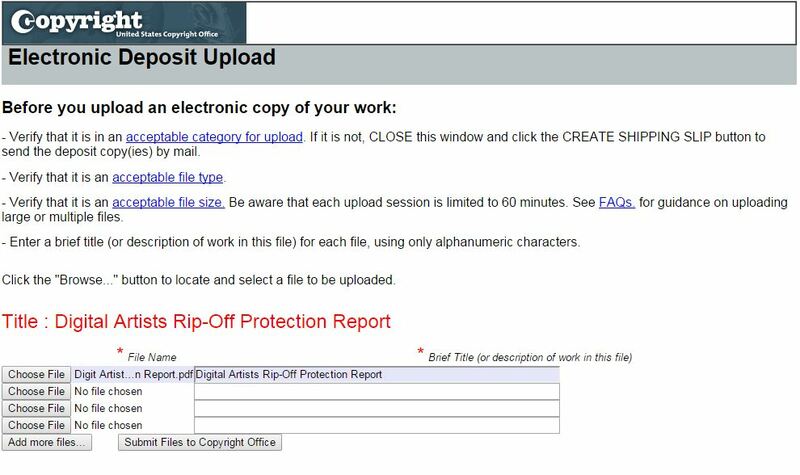 If you haven’t already grabbed a copy of her free Digital Artists Rip-Off Protection Report, make sure you don’t miss out on the chance to get this extremely helpful resource! The mantra chanted by people like me (copyright lawyers) in favor of registering the copyright in your work with the United States Copyright Office is that if you have registered your work in a timely manner and somebody infringes it, you can sue them and possibly recover your attorneys’ fees and statutory damages (up to $150,000 per infringement). Attorneys fees and statutory damages can be a powerful big stick to use against evil deed doers, or infringers. 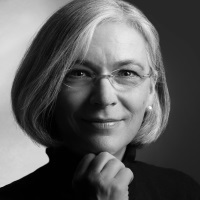 The threat of a substantial monetary award can be useful to quickly resolve disputes. It may be that the notion of initiating and financing a federal lawsuit for copyright infringement is alien to you. The question becomes—if you’re not going to litigate—just how useful is a copyright registration on your work? The answer is that it’s hard to know right now what action you might want to take in the future if your work is infringed. But for $35, it makes sense to create basic protections for your work after you’ve spent countless hours writing and editing and real money on editors, cover art and book design. Throw down the extra $35 and file for that registration. One day, you just might need it. Today we’re going to go step-by-step through the online application process for registration of a Literary Work by a single US author. (My apologies to Marcy’s non-US readers for lack of relevance.) 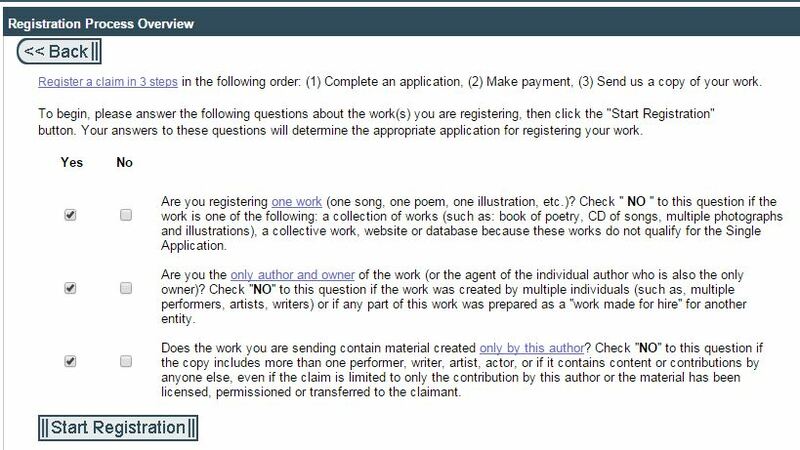 To illustrate the process, I’m going to show you actual screenshots of the application for registration of my “Literary Work” Digital Artists Rip-Off Protection Report which I wrote in October 2014 and revised in November 2014. In order to file an application online with the Copyright Office, you need to create an account which means a username and password. I know, it’s just another ID/password combination to forget . . . I mean remember. It is possible to register your work old-school style by mailing in a paper application. That costs $85. The savings for electronic filing is significant. 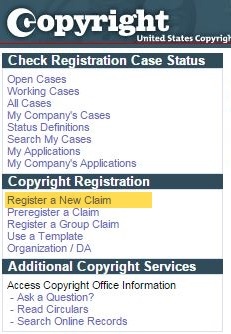 After you’ve created your account and signed in, select “Register a New Claim” using the menu on the left under the section Copyright Registration. The first screen has three preliminary questions that focus on the author or creator. For our example, we’re completing an application for just the text of a work (my report) for which I am the author and owner with material created only by me. The next screen determines the type of work that is being registered. Literary Works include fiction, nonfiction, poetry, textbooks, reference works, directories, catalogs, advertising copy and other written works. Sometimes a work has two or more types of authorship, like a book that is mostly text but has some photographs. In that case, choose “Literary Work” because the work is made up of mostly literary material. 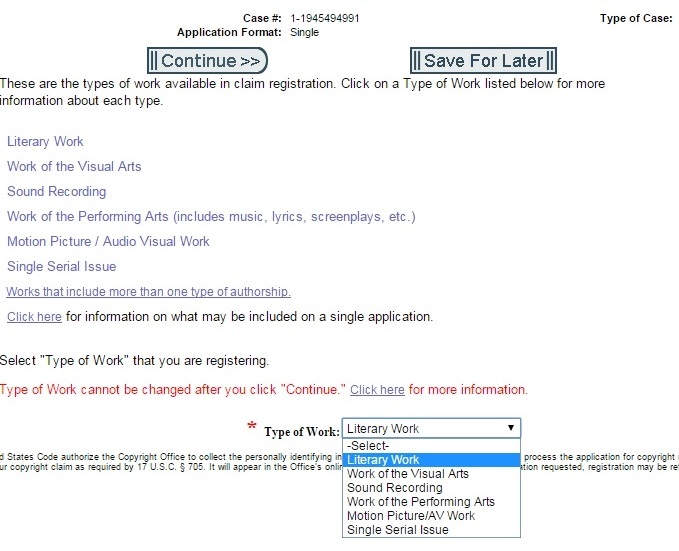 Remember, this is not an example of filing an application for a work that is created by two different authors. This is a single author application. A published work is one that is offered for sale or distribution to the public. Online content is considered to be published if the copyright owner authorizes the end user to retain copies of the content or further distribute the content. Once you’ve uploaded your ebook to Amazon, or anywhere for that matter, for sale or free download, it is considered published by the Copyright Office. An application for registration is considered timely if it is completed within three months of publication or before infringement. This is the section in which you identify yourself as the author of the work. As you move through the form, there is a checklist that updates as you go showing you how much of the application you’ve completed and how much there is left to go. This is the section of the application referred to as “Limitation of Claim” in the progress checklist in which the material not created by the author is excluded. In this case, I have excluded the photograph and the cover art because I did not take the picture or create the cover. My portrait was taken by Chris Stadler. If you select excluded material, you must also select the included material. In this case, I am only seeking copyright on the text that I wrote. If I complete this form for one of my clients, this is where I identify myself as the contact person. You can identify yourself in this section. NOTE: This information is publicly available and you want to be careful about what you include. I use my office address, email and phone number. The correspondent is the person whom the Copyright Office will contact if there is a question about the application. This is a service I handle on behalf of my clients but you can identify yourself in this section. Because a registration is needed in order to bring a lawsuit for infringement in the United States, you may have to request special handling to expedite the filing. Special handling is significantly more expensive than a regular filing by hundreds of dollars. If you did not file within three months of publication or before infringement, you will not be entitled to statutory damages and attorneys fees but you will be entitled to injunctive relief. Injunctive relief means that you can ask a court to issue an order that the infringer stop the infringing action. In an ideal world no special handling is needed because you have added copyright registration to your work flow and when you need it, it has been done. I recommend that you make applying for copyright registration a regular habit when you finish each book. That way, if you decide you must file a lawsuit, you’ll be ready and you won’t be scrambling. Is the section of the application in which you swear that it is your work or that you are the authorized agent of the creator. If the application is correct, add it to your cart and check-out for $35. If there are any mistakes, now is the chance to fix them. After the U.S Treasury processes payment, the Copyright Office will ask for the deposit copy of the work which you should have ready on your hard drive. A deposit copy is a copy of the work for which your are seeking registration to be kept by the Library of Congress. Before clicking upload deposit, make sure your pop-up blocker has been disabled. Browse for and select your file. In this case mine is a PDF, type in a short title and submit. When your deposit copy is received, you’ll receive an email from the Copyright Office confirming a completed application. From that point, it will take about eight months to receive the Registration. But the effective date of the Registration is retroactive to the date of the application. The timeliness of the application is what is important. The application can become more complex if there is cover art, an introduction or other supplementary materials in the work that you did not create and you want protection for those elements of the work. 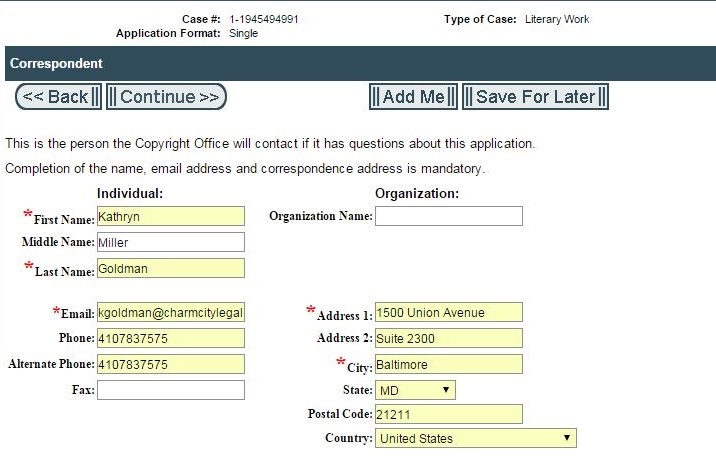 The Copyright Office has tried to design the online application so it can be completed by individuals without the help of an attorney. But if you have questions, let me know in the comments. Kathryn Goldman is a lawyer who protects writers, artists, and businesses from having their work and art ripped off. Since she’s a lawyer, she has to mention that she’s not *your* lawyer (so this article isn’t technically legal advice), but you’re still invited to download her Digital Artists Rip-Off Protection Report. Marcy here again: I’d love to have you sign up to receive my posts by email. All you need to do is enter your email address below and hit the “Follow” botton. Thank you for this article. Very useful. I bookmarked it and also downloaded Kathryn’s book. Copyright is not something I think about when I write my stories, though I should. After all, it’s better to have it and not need it than need it and not have it. I have one short story published so far, so I guess I should go back and copyright it. I will certainly add applying for copyright protection into my publishing To Do list from now on! I’m glad you’re putting copyright registration into your work flow. It’s a good habit for adding extra protection to your work. Thank’s for downloading the Digital Artists Rip-Off Protection Report and thanks for the comment. I pretty much followed all your steps for my first novels, all pbooks. Now I only “publish” ebooks without any corresponding pbooks. It’s never been clear to me what to do in this case…but maybe I missed it in your instructions. Because all my ebooks (including the ebook versions of two of the pbooks) are available on Amazon, it’s clear that as along as that company is around, I have evidence that they’re mind. Do I really need more? Having your books on Amazon (and I think Amazon will be around for a while but perhaps not forever), may be “proof” that the books are yours. Copyright registration does more. It gives you the right to bring an infringement lawsuit if you choose. It also allows you to leave the rights to your work as a bequest to your heirs. Remember that copyright survives you. Registrations have that added benefit, especially useful if you’re building a body of work. So, how do I copyright an ebook (beyond the ubiquitous copyright statement at the beginning)? Am I confusing this with the LoC? I seem to remember I had to send a physical book also to the copyright office, though. What happens if there’s no pbook version of the ebook? Formal copyrighting and an ISBN number just adds to my ebook costs. I do the latter (one for .mobi i.e. Amazon and one for other formats i.e. Smashwords)…I don’t think the proprietary ASIN is enough, especially if there’s a Smashwords version. You’re the lawyer, but I’ve been told that informal copyrighting (statement at the beginning of the ebook) is enough to launch an infringement lawsuit (and I don’t have the money to do that either, unless a lawyer takes the case pro bono, probably only lucrative if the infringement involves a screenplay). Thanks for your instructive post, by the way. It confirmed that I did something right way back then with my first pbooks (POD), even though I was a newbie. These instructions are for filling out an application for an ebook copyright registration (as well as for a book in print) for the Library of Congress. 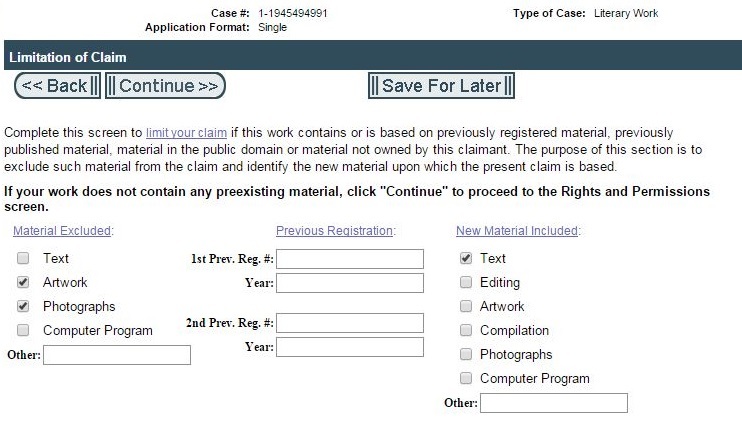 The LOC is the only place you can obtain a copyright registration on your work. I’m sorry if that wasn’t clear. 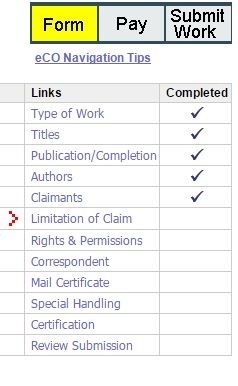 There is a field for the ISBN on the Publication/Completion screen. 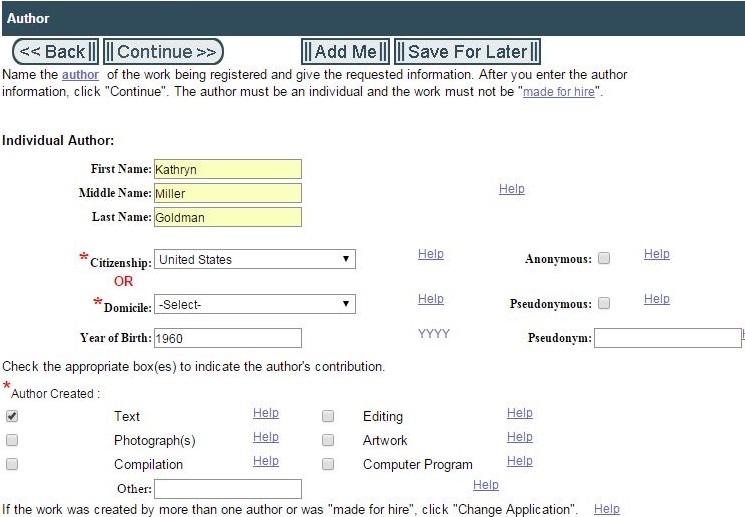 You can upload the digital file of your book at the Electronic Deposit Upload screen. If you want to begin a lawsuit for infringement, you must have a copyright registration. You have a better chance of finding a lawyer to take your case if your work is registered because then that lawyer has a chance to recover her fees, if successful, and you have a chance at statutory damages. But you do not lose your copyright if you don’t register. You’re just limited in the enforcement actions you can take. OK…and thanks. Maybe the process has changed since I registered my pbooks? Seems easy enough. A few more questions: What happens with the two ISBNs, one for Amazon and one for Smashwords? Do I have to register both ebooks separately even though they’re the same? What happens to the author who only has an ASIN (not my case, but fairly common, methinks)? Finally, any chance for a package deal where I get a discount for doing a bunch of ebooks (I’d have to register fourteen)? Sorry. I’m only making a nuisance of myself because other people might have the same questions. These are not nuisance questions, at all. I am happy to answer them. As for the two ISBN issue. The first ISBN gets listed on the Publication/Completion screen. I don’t think you can add a second one there. But on the Certification screen, below the box where you “sign” the application, there is a field to add a note to the Copyright Office (I did not include that box in this tutorial because I left it empty). This is where you can tell the Copyright Office that there is another ISBN for the same work. There is no need to file two application just because you have two ISBNs. As for the “group deal” question . . . no group deals for published work of this nature. There are some group options for things like serial works (newspapers for example, not fiction series) and unpublished photograph collections. But for books, it’s one application (and one filing fee) per work. Great article, and I’m feeling especially happy because I already registered mine! It was needed to be eligible for an SCBWI award for self-published books. But I just went to check that I got the confirmation email, and it reminded me that I hadn’t sent the physical copies of the book, so it’s timely for me, too! Thanks so much. Eligibility for awards for self-published books—that’s another reason to register the copyright in your work that I had not thought of. Professional writers associations may view copyright registration as an indicator of “legitimacy” for the self-published author. Professionals (not just writers) are expected to invest in their career/business. Copyright registration is one of the costs of doing business and sends the message that you are a serious, professional writer. Hi, Kathryn, thanks for the useful post. My question is what do you recommend for unpublished work? I have been contacted by an agent in India for a partial. It would be fantastic if she asked for a full, but I’m a little nervous about my rights in a foreign country. Protection of your work internationally is a sticky problem. A Copyright Registration may not necessarily help you, but it most certainly won’t hurt. When working with agents, as a general rule, there is limited risk of having your manuscript stolen or infringed. Agents are interested in building and maintaining their reputation, so they are not likely to take or use your work without authorization. Their name would turn to mud in the industry if they did. Your real protection is in knowing the reputation of the agent before you send out your work. Get references and check them. Make sure you’re comfortable. A large part of being in business (and agents are your business partners) is trust. If you have doubt, don’t do it. One last question and then I’ll buzz off: I don’t have .mobi or ,epub files for any of my ebooks! My SOP for prospective reviewers and so forth has been the “gift option” (Amazon Whispernet) and the coupon (Smashwords), although my ebook formatter has also provided PDFs to picky people. Can I “gift” an ebook through eCo? I suppose I could buy the book at Amazon or Smashwords, download it, and then attach the file? (Probably answered my own question.) Back in the day, one had to select a digital media option to do this. Clearly, what I need to do is experiment with one ebook, especially because there are no “package deals.” I remember when I went through the process with my pbooks, the eCo site crashed several times (a failure of most government sites? ), but that didn’t matter because the physical book would be sent via snail-mail (I figured one of the transaction numbers would work, and they did). With the digital media, I’m a wee bit paranoid about having an electronic file of my book floating around in internet space-time. In my old day job I used to write UNIX scripts. I don’t know why this process seems so difficult. One thing is certain: in my budget for each new ebook in the future, I’ll add an entry for copyrighting. Thanks for your sage advice. PD. I thought of another question (are you tired of me yet? ): Material on my website–blog posts and short stories might be critical–carry an implied copyright too (it says so on my home page, both in text, and at the bottom of the webpage, although I allow free use of posts that aren’t short stories as long as my name is mentioned). Does this require an eCo copyright if I want to sue someone for stealing a post? Nope, not tired of you yet. Answering questions is one of my favorite things to do. First, as for the deposit copy — you have three options here. First, get a PDF from your book formatter for every one of your books and store ’em somewhere. There’s really no reason for you not to have a formatted PDF copy of your books. Second, take the Word version and save it as a PDF. You are not registering the format, only the text. Or third, if you are anxious about uploading a digital file to eCO, although I didn’t talk about it in the post, there is an option for mailing them a hard copy. Second, your question about copyright protection for blogs is an good one. I recently wrote a post for plagiarismtoday.com Why is the Copyright Office Denying Protection to Blogs? which you might find interesting. P.S. Steven, if you sign up for the Digital Artists Rip-Off Report, you may find answers to many questions you did not know you had! Thank you for posting this, Marcy. I’m on Ms. Goldman’s email list and received a copy of a link to this discussion. Some friends of mine from some other writing forums were discussing this and wondered how this might apply to an author who chooses to self-publish under a pseudonym. 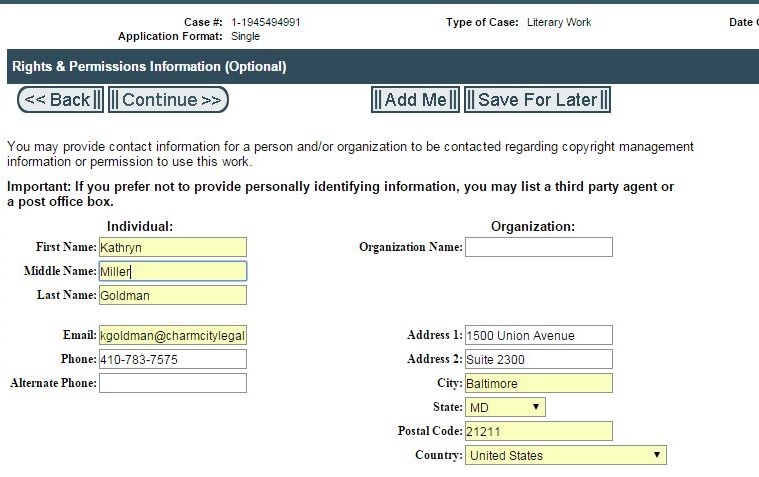 Since the information posted here is, as Ms. Goldman pointed out, a matter of public record, I gathered whatever is inserted into the address, email and phone number fields is viewable by anyone at any time. People I’ve known who publish under a pseudonym do so because they don’t want fans or the general public knowing where they (and their families!) live to avoid having people “drop in” unexpectedly and uninvited, their email accounts flooded, or their phone numbers to avoid calls in the middle of the night from who knows who. If one desires to publish under a pseudonym, does that make these suggestions here more or less implementable if they desire their copyrighted work be registered? Thank you in advance for your reply. There are a couple of issues you should be aware of when registering a work under a pseudonym. First, email and phone number do not show up on an online search, but may be publicly available at the Copyright Office. Claimant’s address does show up on the online search. Perhaps a P.O. Box would be a worthwhile investment to protect your privacy. Second, the term of copyright for a pseudonymous work is 95 years from publication or 125 years from creation whichever comes first. Depending on your age, you may benefit from a longer copyright term (life plus 70 years) if the identity of the author is made known. Copyrights are property that can be left to your heirs, so a longer copyright term may be valuable. Thanks very much for sharing your registration process! You began your literary registration process by answering YES to the Copyright Office’s three initial questions, and that identified your work as a “Single” ($35) rather than a “Standard” ($55) Application (ONE author for your “Digital Artists Rip-Off Protection Report”). The sole author needs to have created all elements of the work to meet the lower-priced Single application. Does your work not contain many authorships (text/yours, plus art cover, and a single photograph)? From my registration experiences, if a single-authored work includes any licensed, RF, CC, or PD creative content, it really contains multiple authorships, and consequently, needs to be registered using the Standard Application (you have to answer NO to question three). By “disclaiming” one or more authored elements of your work, are you not acknowledging that your work meets the Standard Application’s criteria? If your Single Application has cleared, then my above-understanding is all wrong! I’m always looking for ways to improve my eCO registration workflow. You could be right about this. Let’s see if the Copyright Office hits me for another 20 bucks or rejects my application. I probably should have ripped off the front cover and registered just the text. I was focusing on illustrating a “Limitation of Claim” for purposes of the tutorial. Nice catch and I’ll let you know if the registration issues. Here’s what I’ve learned: If an application gets flagged, the eCO will send the applicant an email explaining why the registration doesn’t fit the Single Application criteria. In short, the applicant will have to log back into the account, select the corresponding Working Case, and correct the registration. The amended application and submission of an additional $20 filing fee are due within 20-days. It looks like the effective date of registration will be changed to a later date. I thought, perhaps, the Office would have offered some leniency since this is a new registration process; I also find the http://www.copyright.gov/fls/sl04s.pdf instructions not completely clear. It would have been nice had the Office included a simple note stating that any “LICENSED” material included in a work will require the applicant to use the Standard Application. I imagine many creatives are unwittingly and incorrectly using the Single Application form. This also creates additional work for Copyright Specialists/Examiners who clear our registrations. It could be that PA works (films/videos) are subject to additional scrutiny, as these works often include many separate contributions that are merged into a single finished work. If the video’s end-credits list actors and other creatives, the Examiner will presume that the work has to be either a joint-authorship or WFH arrangement, thus moving the registration to a Standard Application form. My story-telling video projects often include lots of licensed material, especially background music. If a particular video contains solely my own authorship (I’m using my own materials, performing all the directing, photography, script-writing, interviews, and all other creative functions; there are no joint-authors nor WFH contributors) but it includes a licensed music track, I’m inclined to register just the video, without including the music in my deposit (I’d have to disclaim the synched-music license in my registration, anyway). With this option, I can save $20 by using the Single Application submission. Limiting Claims can be a confusing component of the registration process. You’re one of a few attorneys I’ve come across who has taken time to explain this function. I, and I’m sure others, have found your registration tutorial helpful! Hi, Kathryn. I am co authoring a book with my 6 year old who contributed words. Do I file single or standard? Also, it is a children’s book with illustrations that I am purchasing with a fewelancee who agreed to waive rights Any tips on thw copyright that I need to manage there? If the book is co-authored (even if it is with a child), you’ll have to use the standard application. As for the illustrator who released her rights, get a copyright assignment in writing and file it with your application. So, that’s another reason you can’t use the single eCO form. Great job on getting your 6-year-old involved in book creation! What a fun project. Thank you for the prompt response. The illustrator is giving up licensing rights not copyright so I will file it with my copyright application. UPDATE: Today in the mail, I received the Certificate of Registration on the work I applied for as part of this tutorial post. After 25+ years of registering the work of others, I now have a certificate of registration of my very own. First, from application to issuance of the certificate, it took 8 months. The effective date of registration is the date I filed the application, December 1, 2014. Second, the certificate was issued using the Single application ($35) even though I limited the claim to exclude ownership of the photo and the cover art which Art/Creative pointed out should have bumped the fee up to $55. Kathryn, I am an Activity Director at a nursing home with a creative writing group that has been in existence for four years with people coming and going for obvious reasons. Several months ago the group wanted to see one of their stories in book form. An Activity Assistant in our dept., art student, created the pictures. We printed it and put it together in book form. They liked it so well they wanted to do a series of books, several they already completed on the same characters. The illustrated book is the second in the series. They are now completing their fourth story! Our student is only working the first book in the series. Do the stories get copy written individually or one by one and how do I address the flow of participants. They elected as a group to just name the group and not give credit individually in the book. And finally how do I address the illustrations? I found this article most helpful as I just begin to look into possibilities. Thank you, Terri. It sounds like you’re working on a fun and successful project. The stories must each have their own copyright application unless they are published on the same day in a single unit of publication. I have created an expanded tutorial on the Copyright Application for Literary Works that you might find helpful. Here’s a post on how to deal with the illustrations: How Words with Images are Easily Protected by Copyright. I recently came across this post while doing some research. I am submitting my ebook for copyright. I have two questions. The first is this: I created my cover using Amazon (KDP) template, however, I took and edited the actual photos. Can I copyright the whole thing or do I need to copyright the pictures individually? The second is this, there will be a paperback available at some point via Kindle Direct, and they issued me an ISBN. This is only valid on Amazon. Do I need to include this number in the process or leave it out? thank you very much for your article on copyrighting. I have recently registered the copyright for a children’s picture book which was published as a paperback. I had a pdf file and the upload to eCO was easy. Now I’m struggling with the ebook version: it includes some additional text and pictures and an interactive quiz. First question: shall I register this version, too?